A new theory about what drove the Vikings to raid Western Europe in the late eight and ninth centuries has been published. 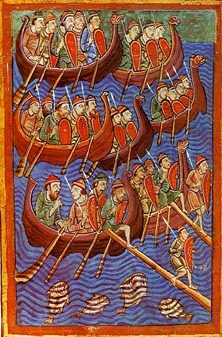 It suggests that the Vikings in Denmark were reacting to a threat from the Carolingian ruler Charlemagne, who was seeking to destroy their society and impose Christianity on them. The article, "The Vikings: Why did their violent raids begin?" is in the December 2009 issue of BBC History Magazine. Click here to download the podcast which contains their interview with Robert Ferguson.